A spider of another kind. No doubt, Fiat’s North American product line is lacking a signature model, especially one that could elevate this Italian brand’s position in the market. The 500 and 500L have fallen far short of expectations, while the 500X is showing much promise. Still, aside from a few Abarth models, the fun factor is absent from a brand that desperately needs such a competitive edge. Beginning next year, Fiat will finally get the niche model it needs. It’ll come in the form of the Fiat 124 Spider, a model initially rolled out a half century ago. However, the latest iteration moves past its Fiat roots and comes courtesy of Mazda. 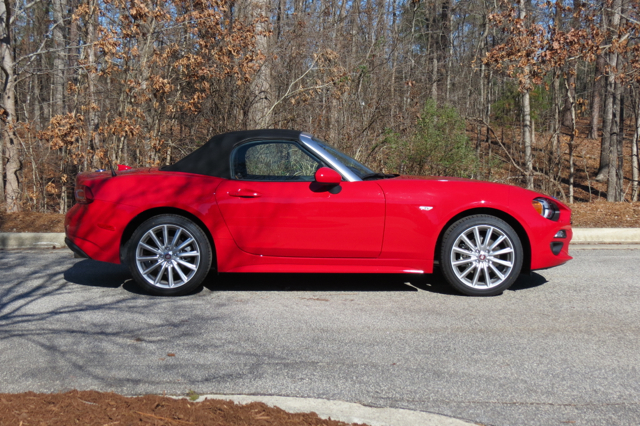 Indeed, the 124 Spider is based on the architecture supporting the Mazda MX-5 Miata, while advancing its own design. Thus, enthusiasts have dubbed the new model the Fiata in recognition of this unique industry partnership. The 2015 Los Angeles Auto Show provided a fitting venue for this rear-wheel drive model’s release. Californians have a thing for roadsters, and if there is a particular market that can give this brand the necessary impetus to move forward, the Golden State is certainly it. Although the 124 Spider shares its architecture with the MX-5 Miata, there are a number of components and features unique to this vehicle. For one, the roadster will be powered by a 1.4-liter, turbocharged four-cylinder engine, making 160 horsepower and 184 foot-pounds of twist. This “Tiger Shark” engine is familiar to Fiat Chrysler Automobiles (FCA) fans and should find a welcome home under the hood of the 124 Spider. It comes paired with a 6-speed manual or a 6-speed automatic transmission. The style is all Fiat or at least it is heavily influenced by the company. The front fascia is marked by a broad grille with a wide upper portion and a narrow lower air intake. Distinct wraparound headlamps are accented by circular LED daytime running lights. The lower grille is hemmed in by parking and fog lights set within beautifully sculpted embrasures. From stem to stern, this model flows naturally. Petite, but muscular shoulders, upper and lower profile character lines, and rocker panel embellishments are also present. Fashionable 12-spoke aluminum alloy wheels help draw attention to this vehicle. At the rear is a broad deck, marked by oversized combination lights, body sculpting, and dual exhaust tips. An easy opening soft top convertible roof rounds out the visage. Inside, this model comes with its share of creature comforts, including keyless entry and push button start, a FIAT Connect telematics system with a 7-inch display, multimedia control, Bluetooth connectivity, and heated seats. Upgrades include a 9-speaker Bose audio system. A double-wishbone suspension system up front and a multi-link layout in the rear are present. The latter is tuned to provide superior stability while braking as well as turning. An electric power assist or dual pinion steering system is also present. To mitigate noise, an acoustic windshield and insulation treatments have been employed to enhance the driving experience. When the 124 Spider arrives in Fiat studios in summer 2016, it will initially be offered as a limited-edition Prima Edizione Lusso model garbed in Azzurro Italia (Blue) exterior paint along with premium leather seats in a saddle hue. After that, two trim levels will be available — Classica and Lusso. Each one will offer six color choices. In addition, the Lusso or luxury model will offer a tricot crystal white pearl color as an upgrade. The Fiat 124 Spider represents the second time this year a Mazda model has been transformed to supply a vehicle to a competing manufacturer. In September, the Scion iA rolled out, a subcompact sedan built for Toyota and based on the Mazda 2. For Mazda, these partnerships are beneficial as the company reaps financial support while maintaining its independence. It also allows the company to spread its costs across more model lines and use those savings to fund new models, including an expected rotary-powered sports car. All photos courtesy of Auto Trends Magazine. All rights reserved.